Soooo I hope that everyone is good and well... 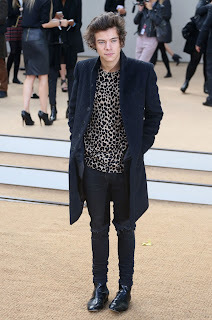 This coat is my favourite thing ever in my wardrobe at the moment, its old stock River Island! It's keeping me warm from this blooming cold weather here in the UK! Turtle neck - Forever 21, Coat - Old River Island, Bag - Louis Vuitton - Speedy 35, Moon Face Necklace - Topshop, Jeans - Topshop, Socks - Topshop, Trainers - New Balance 574 - Via Schuh. Denim Jacket - Vintage Levis, Shirt - Charity/ Thrift shop, Jeans - Topshop, Pad Lock Necklace - Topshop, Bag - Louis Vuitton - Speedy 35, Glittery Socks - Topshop, Boots - Topshop. Heeeyy guys! So the other day I just had to do a few jobs around town and then met up with my best friend that I haven't seen in ages for a nice meal which was lovely! I love this shirt more than I really should, It just fits really nicely so you will be seeing this a lot I'm afraid! Coat - Topshop, Top - Topshop, Moon Face Necklace - Topshop, Gold Chain - GOGO Philip, Jeans - Topshop, Boots - Topshop, Bag - Louis Vuitton - Speedy 35. Hello lovely people! How is everyone?!... So it's getting cold here in the UK, winter is definitely coming! This coat is last year Topshop that I hardly wore, So I decided to dust it off and wear it today... I love the texture and it is SOOO warm! Also these boots have to be the comfiest boots I own, and they was only £36... WHAT A BARGAIN! I can see that I will be wearing these bad boys a lot this Autumn/ Winter! Hey guys, A short post today! The other day I bought this Topshop Beekeeper Felt Hat - £25 and I just don't know if I should keep it or not! So that is where you come in... What do you think? Be honest does it suit me or not?! I hope that you have enjoyed this blog post and as always I hope that you all have a lovely and wonderful fashionable day! Bomber Jacket - Vintage, Top - Topshop, Necklace - Topshop, Jeans - Topshop, Loafers - ASOS. NOW on to the blog post... This vintage bomber is my 'Go To' jacket at the moment, It just goes with everything! You may or may not have noticed that I have made a sneaky new recent purchase... If you have read my last post 'A/W WISHLIST' then you would have seen that my 'ASOS MY TOWN Leather Loafers' was one of the many items on there, aren't they just BEAUTIFUL?!? I think I'm in love... I purchased a size 3 as that is my original shoe size but had to take them back as they was too big... WHAAA?? So I was pleased to see that they had them in a size 2 and fit perfect... PHEW! But how ridiculous? So if your maybe thinking of purchasing them, I advise to go a size down. I hope that you have enjoyed this blog post, don't forget that you can follow me on Twitter on @Fashioninkatie & Instagram on @fashionablelittlekatie. 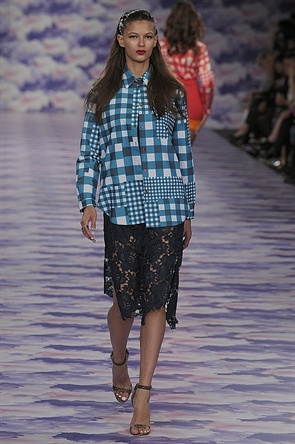 So yes its good bye summer and hello A/W... YES!! A/W is my two favorite seasons as I love to layer and just love my big jumpers to get nice and warm up to. So here is my A/W wishlist for September anyway ;) My wishlist is always too much... I NEED TO BE RICH! Now, there was so many designers that I could have put in this post but I narrowed it down to my top four favourites. 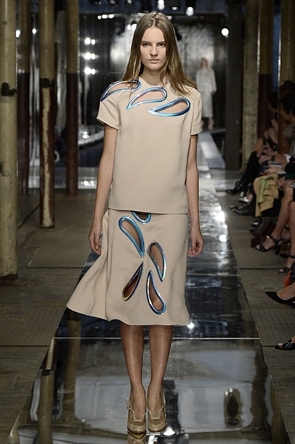 Christopher Kane isn't a designer that I haven't really taken much notice to, until now! I just loved the feminine but with a cool vibe was going on and also the tear drop metal cut outs was something different to your normal cut out. To see all of the collection click here. 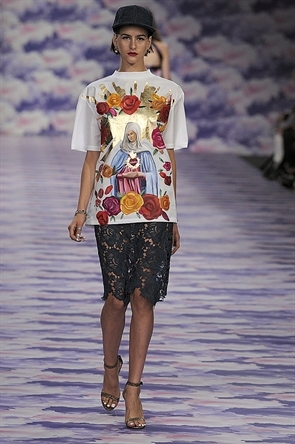 Henry Holland, WOW! This collection for me was just so me! 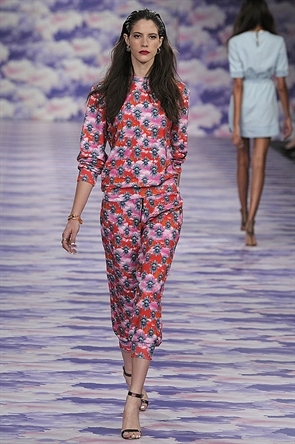 the colours, shapes and the prints was just so beautiful... 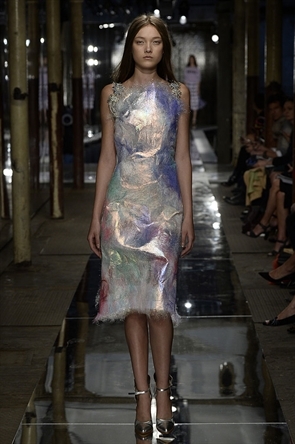 I always find his collection very young and edgy, You could easily dress it down or dress it up at the same time. The matching two piece was a yes from me, I do like them but haven't found the right one for me and this one screams yes to me. IN LOVE. 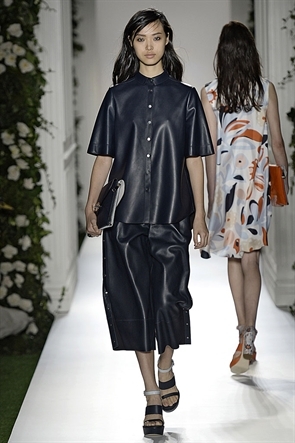 Mulberry just got it right with the simplicity of the collection but then with a definite British edge too. The double sided clutches was to die for also! So wearable in my opinion and clean looking. Burberry... Where do I start? AMAZING! Very ladylike, classic but then it also has a cool twist with the fun colours. Dare I say VERY British and fresh... 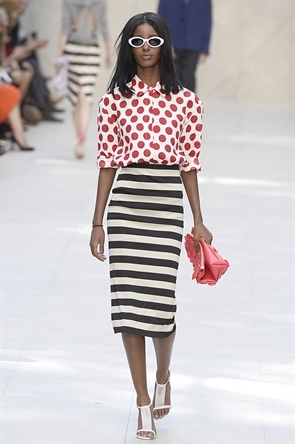 The boxy coats with the mid skirts and also the clash of the polka dot patterns and the stripes just worked. There seems to be a pattern going on from this season... Have you noticed? PASTELS! 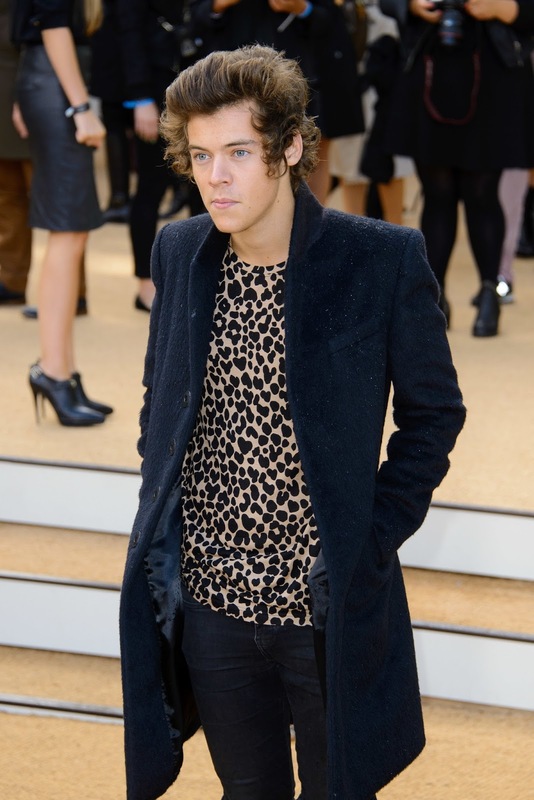 Ohhhh Harry Harry Harry Styles how handsome you looked at the Burberry Prosum SS14 show was beyond! Now I put my hands up, I am a little bit of a One Direction fan! Am I ashamed? NEVER! ANYWAY... 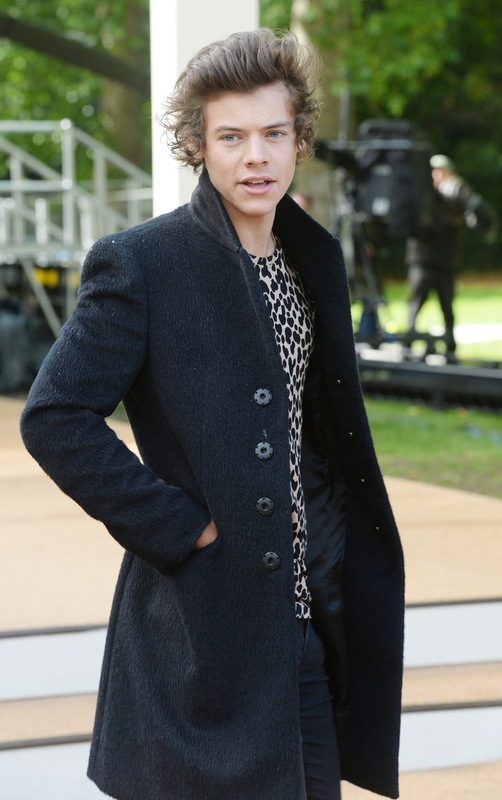 I find Harry always has a edgy look to him, I think its the hair? But for a 19 year old and a boy he does have good style in my opinion. He was wearing a Burberry Prosum Cheetah print shirt with his normal ripped at the knees skinny jeans and leather shiny boots with a navy peak coat. 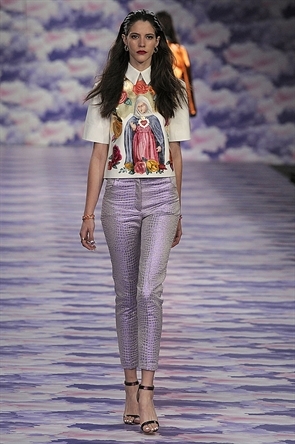 So yes that was my top four favourites from SS14 London Fashion Week, I unfortunately wasn't there! But on YouTube I am subscribed to FashionTV channel, So I watched all of the shows that was streamed on there... GO they are amazing! Click here. You may have noticed that my blog looks a little different? Yes I thought that I would give it a more clean look! What do you think? My last look I felt was too much. Actually guys I do need a bit of help, on the top right of my blog underneath the 'That's Me.' you will see my chops... Now the picture is tiny! I need it BIGGER! I am a big numpty I know and its probably really simple but I cant seem to get it bigger! 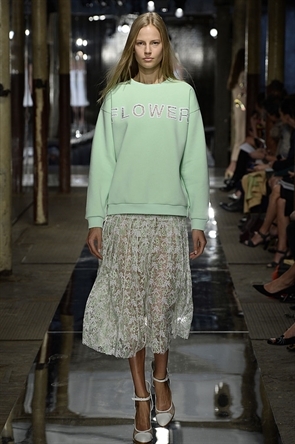 Anyway PLEASE let me know what your favourites where from LFW, I would love to know!